PLSOLUTION-FD GMP Grade is an animal serum-free and fibrinogen-depleted human Platelet Lysate for usage as cell culture supplement. Due to the innovative fibrinogen-depletion process, PLSOLUTION-FD GMP Grade does not require any heparin addition in cell culture. PLSOLUTION-FD GMP Grade is manufactured under GMP conform conditions and supports the expansion of various human cell types in clinical trials, particularly adult stem cells, e.g. MSCs. PLSOLUTION-FD GMP Grade is manufactured from platelet units obtained from healthy blood donors at FDA-licensed blood centres. PLSOLUTION-FD GMP Grade has been used to produce FDA-approved clinical-grade MSCs for multiple Phase I cell therapy trials (Drug Master File available). 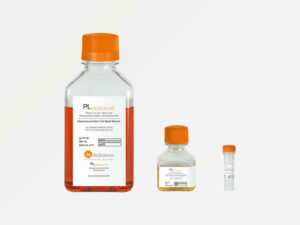 PLSOLUTION-FD GMP Grade is provided in validated Nalgene® bottles in different sizes.